Heat oil in a pan, add mustard seed,urad dhal,curry leaves & saute few mins. Add tindora,aloo chilli powder, turmeric powder,hing,salt & mix well. Allow to cook with lid on top & if needed sprinkle water. Cook until almost done & serve hot with Plain rice or rotis. Nice combo with rice...looks good. I love kovakka, we don't get here though which is a pity. Its looking lovely.. and nice combination. Perfect color and goes well with rice and roti. Love kovakkai, new combination with aloo. Nice dish. Wow spicy n yummy dish. Love the combo of tindora with aloo...great with rice! 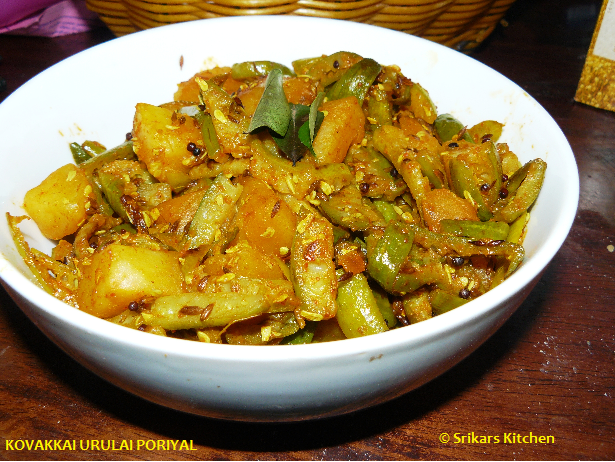 I like Kovakkai a lot, but never paired it up with potatoes. I love the way they are sometimes a bright red when ripe inside... such a cute looking veggie it is. This dish sure looks yummy, loved your special biryani masala..need to try making my own too :). You are lucky to have a chef in your own house..so who does the cooking gal?? Lovely combination,very new combo too..looks yum! Very nice combo... I deep fry both the veggies... but never thought of combining them... will do it next time! !